An online operation cannot be performed for index ‘…’ because the index contains column ‘…’ of data type text, ntext, image, varchar(max), nvarchar(max), varbinary(max), xml, or large CLR type. For a non-clustered index, the column could be an include column of the index. For a clustered index, the column could be any column of the table. If DROP_EXISTING is used, the column could be part of a new or old index. The operation must be performed offline. To be accurate the restriction applies not to tables, but to any index or heap that contains an LOB column. That, of course, includes any clustered index or the base heap of a table if the table contains any LOB columns, but it would include any non-clustered index that includes a LOB column. In other words I can rebuild online non-clustered indexes of any table as long as they don’t use the INCLUDE clause to add a LOB column from the base table, but for sure I cannot rebuild online the table itself (meaning the clustered index or the heap). Nor can I add a clustered index to a base heap online, if the table contains LOB columns. The question whether one should just use VARCHAR(MAX) and stop worrying about the chosen field size has came up on StackOverflow several times (varchar(max) everywhere?) and I always pointed out that there are at least some limitations (impossibility to do do online maintenance rebuild operations, impossibility to index such fields) and also all MAX types have a slight performance overhead, see Performance comparison of varchar(max) vs. varchar(N)). Starting with SQL Server 11 it is actually permitted to build (and rebuild) online indexes and heaps containing LOB columns. The old legacy types (text, ntext and image) are not supported, not surprising considering that these types are on the deprecation path. We can see that our DATa and SLOB (aka. row overflow) allocation units have changed because they were rebuilt (they have different IDs and start at different pages). But the important thing is that the BLOB allocation unit has not changed. After the offline table rebuild, it has the same ID and starts at the same pages. This is because table and index rebuild operations do not rebuild the LOB data. They rebuild the row data and the row-overflow data, but the newly built rows will simply point back to the same old LOB data. The idea is that tables with LOB columns have large LOB values and rebuilding the LOB data would be prohibitive, with little or no benefit. 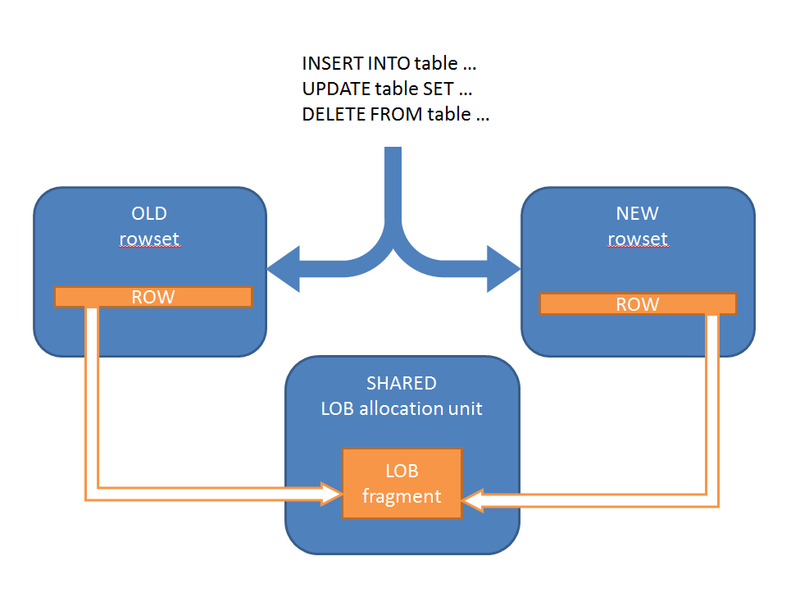 Offline operations can avoid rebuilding the LOB data without problems, but for online index and table rebuilds this poses an issue: for the duration of the online rebuild operation both the old rowset (the old index/table) and the new rowset would point to the same LOB data while updates are being made to rows. In SQL Server 11 this problem was solved and now online operations can rebuild indexes and tables with LOB columns while keeping the data in the LOB allocation unit in a consistent state. SQL Server will internally track how LOB data is referenced by both the old index and the new index being built and will take appropriate actions to manage the sharing of the LOB data. Partial LOB .WRITE updates are transformed into full updates. LOB data supports a highly efficient update mode, the .WRITE syntax. This is critical in creating streaming semantics, see Download and Upload images from SQL Server via ASP.Net MVC. When the .WRITE syntax is used on a LOB column belonging to an index that is being rebuilt online the generated plan will silently change it into a full value update, which generates significantly more log. If you rely heavily on this functionality be aware and schedule your online rebuilds accordingly. DBCC CHECK operations will skip the consistency check of LOB allocation units belonging to indexes that are in the process of being rebuilt online. During the online operation the LOB allocation unit is shared between the old index and the new index and is consistent if you consider both owners, however it may look inconsistent if considered from either one of the owner point of view. File SHRINK operation will skip pages belonging to LOB allocation units belonging to indexes that are in the process of being rebuilt online. If LOB data is shrunk the pointers in the ROW data referencing the LOB data that had moved have to be updated. While an online index rebuild occurs there could be two sets of pointers referencing the same LOB data, one in the old rowset and one in the new rowset.